Crash-a-rumbleSmash-a-grumbleWhat's at work? Here's a clue:It will clear the ground for you.Bulldozer! 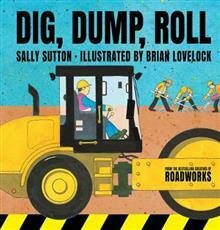 Coming through!This is the follow-up to Roadworks that will delight tiny truck enthusiasts. It's an engaging, interactive text that asks readers to guess what kind of vehicle is... read full description below. Crash-a-rumbleSmash-a-grumbleWhat's at work? Here's a clue:It will clear the ground for you.Bulldozer! Coming through!This is the follow-up to Roadworks that will delight tiny truck enthusiasts. It's an engaging, interactive text that asks readers to guess what kind of vehicle is at work. Visual clues alongside the text help ensure that our readers are challenged but can still be successful with their guesses. In the end, the vehicles work together to build a surprise. Sally Sutton is an award-winning, best-selling children's author of picture books such as the 'Roadworks' series (illustrated by Brian Lovelock) and junior fiction such as the 'Miniwings' series (illustrated by Kirsten Richards.) She is known for her boisterous rhymes, playful language and humorous plots. Sally lives in Auckland with her family.